For the first time in recent history the Court and Livery Dinner on Wednesday 10 April took place at the impressive Saddlers Hall. Guests were greeted at the top of the stairs by ‘The King’s Champion Saddle’ which was likely used in the coronation of George III in 1760. Clad in full armour, carrying a gauntlet the Kings’ Champion rode into Westminster Hall and delivered a challenge – throwing down his gauntlet – against anybody who might oppose the Sovereign. After the third challenge, with no response, the Monarch would toast the health of the Champion, in the knowledge that he was undisputed as Sovereign. After a delicious meal of salmon, beef, blue cheese panna cotta and crêpe suzette, the Master announced that we had to literally sing for our supper by singing the Grace. Liveryman Nicholas Morton opened the speeches by welcoming new members of the Court and new Liverymen and Mr Denis Lesgourgues from Armagnac, who kindly donated the Armagnac for the evening and will be making up this years Master’s Cask. The guests speech was given by Dr David Pearson, a long-time friend of the Master and an expert in marketing. During his speech, he told the story of when Sony launched a pocket radio which was actually too large for a shirt pocket, prompting Sony to sew extra large pockets on the salesmen’s shirts! The Master reminded us all that it had been a year since the whisky auction had raised £220,000. The following day (11 April) Prince Harry was opening a Youth Centre in Dagenham which had received £50,000 from the auction – a great example of the worthwhile causes the Livery supports. 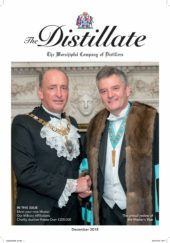 He finished by showing how each of his guests for the evening were all linked together, including The Apothecaries from whom The Distillers descended and at the time described Distillers as ‘men and women whose honesty and skill are of no value’. Finally, before he said goodbye to all, The Master reminded us to avoid the gutter as we left the hall – onto Gutter Lane.